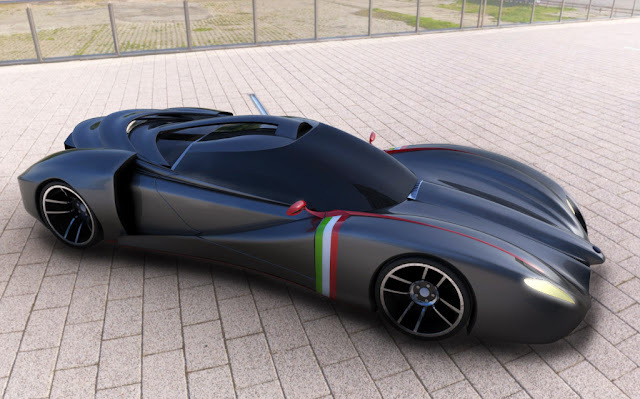 designer Davide Panarella: "Super Turismo"
The “Panarella ST” was conceived with the desire to impress anyone taking a glimpse of this car. 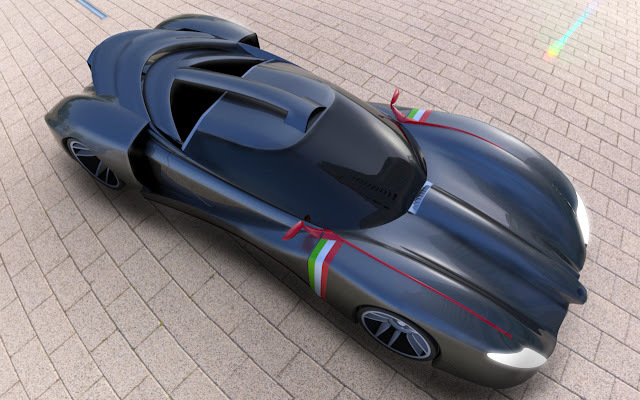 This concept is sportive and aggressive while generating the same performance levels and inspiration from a Formula 1 car. With a sculptural front, a roof air tunnel (purely for style) to its aerodynamically-designed rear wing, illustrates a race-ready machine. and car in check, the three rear wings will create down force to keep the “Panarella ST” planted. Its overall appearance is purely aerodynamic and its excessive length in design, delivers a visual punch. With an attractive front fascia and low central air-intake to keep it streamline, are characteristics of an extreme Formula One car for the road. Lights placed at 45 degrees are reminiscent to a cat-like appearance and showcases a race-ready personality. Further exterior characteristics of the “Panarella ST” are a singular central muffler and three-tier rear wing that shadow the clear engine cover. Powerful LED rear lights are so vivid that they can be seen during the day, for added security. The large, wraparound windshield creates a continuity in design. The roof comes-together with the rest of the exterior establishing a fluidity design, seen in the “Panarella ST”. The interior design is driver oriented and the passenger becomes part of the ride.